After setting a girls' heptathlon junior national record over the last two days, Meg Hemphill (Kyoto Bunkyo H.S.) returned with another big day to wrap up the 2014 Japanese National High School Track and Field Championships. 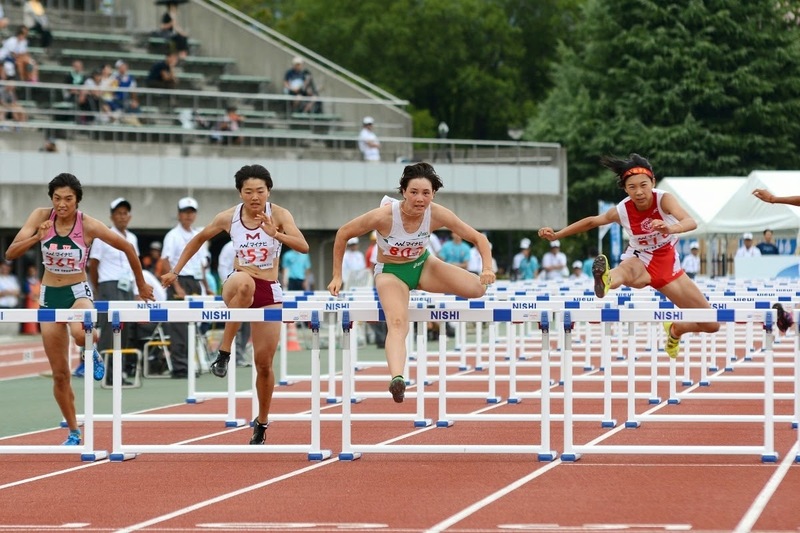 Dominating the heats and semi-finals of the 100 m hurdles, Hemphill ran 13.72 (-0.9) to win the final by 0.11 over Sayaka Kobayashi (Anjo Gakuen H.S.). Doubling in the 4x400 m relay, she anchored Kyoto Bunkyo's team to a 3rd-place finish in 3:44.62, a long way behind winner Higashi Osaka Prep Keiai H.S. in 3:39.17 but just 0.03 out of 2nd behind Soyo H.S. Taking all of her achievements at this year's Championships together Hemphill looks set to be one of Japan's big new names on the track. Boys' 400 m hurdles champion Takumu Furuya (Soyo H.S.) likewise showed good range. After winning the 400 mH title on Friday, Furuya returned to take the 110 m hurdles title in 14.05 running into a -2.4 m/s headwind. In the boys' discus throw, both Ayumu Ishiyama (Hanazono H.S.) and Yume Ando (Tokyo H.S.) broke the National High School Championships meet record with Ishiyama getting the win in a new high school national record of 54.05 m.
In distance action, Kazuya Shiojiri (Isesaki Seimei H.S. ), 9th at last week's World Junior Championships boys' 3000 m steeplechase in a PB 8:45.66, led aggressively and alone, opening a nearly 100 m lead before fading over the last lap. Yuya Suzuki (Akita Kogyo H.S.) and Seiya Shigeno (Yokohama H.S.) closed rapidly on him but ran out of room, Shiojiri hanging on to the win in 8:53.42 with both Suzuki and Shigeno under 9 minutes. For a Japanese high school race it was a notably high level race that compared well with Japan's main university meet, May's Kanto Regional University Track and Field Championships, where the D1 race was won in 8:55.68 with four men sub-9 and the D2 race was won in 8:52.86 with only two men sub-9. All the more impressive considering the National High School Championships took place with temperatures in the mid-30s. The top-end quality of the girls' 3000 m suffered somewhat with the withdrawal of World Juniors 3000 m 4th-place finisher Nozomi Musembi Takamatsu (Osaka Kunei Joshi Gakuin H.S.) from the meet, but Kenyan Mariam Waithera (Sendai Ikuei H.S.) still put on a show, winning in 9:07.75 ahead of Kureha Seki (Ritsumeikan Uji H.S. ), who led four Japanese girls under 9:15 as she took 2nd in 9:14.13. Kenyan Monica Margaret (Aomori Yamada H.S. ), who struggled in the 1500 m final earlier in the meet, finished last among the 18 starters in 9:50.28. Hemphill and Ishiyama were named girls' and boys' MVPs of the meet. In overall team scoring, girls' 4x400 m winner Higashi Osaka Prep Keiai H.S. took the 2014 Championships title with 44 points, Hemphill powering Kyoto Bunkyo H.S. to 2nd with 26 and Tokyo H.S. picking up 3rd with 24 points. Tokyo's Soyo H.S. won its first boys' national title with a score of 42 over Kyoto's Hanazono H.S., 2nd with 31 points. The Tokyo H.S. boys also took 3rd with 25 points. With the Soyo girls taking 5th with 20 points, Soyo's combined score of 62 made it the all-around strongest program in the country.